According to the WikiLeaks Twitter account, Assange was removed against his will. The organization said that the Ecuadorian ambassador “invited British police into the embassy” to arrest the bearded WikiLeaks founder. As you can see from the video, British police seemed to be smirking as he was loaded into a large police vehicle. British Foreign Secretary Jeremy Hunt thanked Ecuadorian President Lenin Moreno in a tweet shortly after Assange was arrested. Assange applied for asylum at the London embassy in June of 2012 over fears that he would be extradited to the United States. Assange was originally arrested in the UK because he faced charges in Sweden over sexual assault-related crimes, but those charges have since been dropped. Assange’s lawyer, Jen Robinson, tweeted that Assange wasn’t just arrested for jumping bail on the Swedish case. She explained that he also faces extradition to the U.S., something that Assange was trying to avoid all along. The UK Metropolitan Police released a statement on its website explaining that they had executed a warrant for Assange’s arrest. We can confirm that Julian Assange was arrested in relation to a provisional extradition request from the United States of America. He is accused in the United States of America of computer related offences. The relationship between Assange and his host country of Ecuador has been hostile over the past couple of years, to say the least. President Moreno even recently accused Assange of leaking his private messages and photos. “Mr. Assange has violated the agreement we reached with him and his legal counsel too many times,” Moreno said earlier this month. Moreno posted a video to Twitter this morning stating that while Ecuador has protected Assange’s human rights, and “provided for his everyday needs,” the country had decided to revoke his asylum claim. Moreno insisted that he had been assured that Assange would not be extradited anywhere where he would face the death penalty. The United States is considered unique in the developed world for having the death penalty, unlike the vast majority of European countries. “In line with our strong commitment to human rights and international law, I requested Great Britain guarantee that Mr. Assange would not be extradited to a country where he could face torture or the death penalty,” Moreno said in his video message. Moreno claims in the video that Assange “installed electronic and distortion equipment” that wasn’t allowed and somehow blocked security cameras at the embassy. Those claims couldn’t be independently verified. In January of 2018, President Moreno called Assange a “nuisance” and an “inherited problem,” due to the fact that it was the previous president who granted the WikiLeaks founder asylum. “If President Moreno wants to illegally terminate a refugee publisher’s asylum to cover up an offshore corruption scandal, history will not be kind,” WikiLeaks said in a statement earlier this month to the Associated Press. Assange had previously promised to leave the embassy of his own free will if Chelsea Manning was pardoned. Manning, who provided WikiLeaks with more than 725,000 classified U.S. government documents in 2010, was granted clemency by President Barack Obama shortly before he left office in January of 2017, but Assange insisted that it was only to make the WikiLeaks founder look like a liar. Manning currently sits in prison for her refusal to testify to a grand jury and was reportedly suffering under solitary confinement until she was later moved to the prison’s general population. 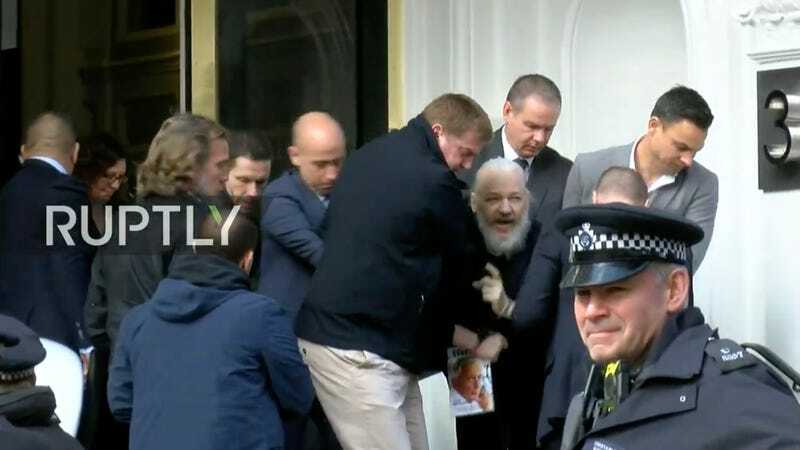 Assange appeared to be carrying a copy of Gore Vidal’s book History of the National Security State as he was dragged from the embassy. The formal charges against Assange can be read here.